Kalypso Media is thrilled to announce the release of Africa – Desert War, the next chapter in the World War 2 strategy title, Sudden Strike 4. Released today for PC, and Xbox One (with PlayStation®4 following on 15th October, Europe only) the Africa – Desert War add-on is based on the most notorious desert skirmishes in North Africa during World War 2. 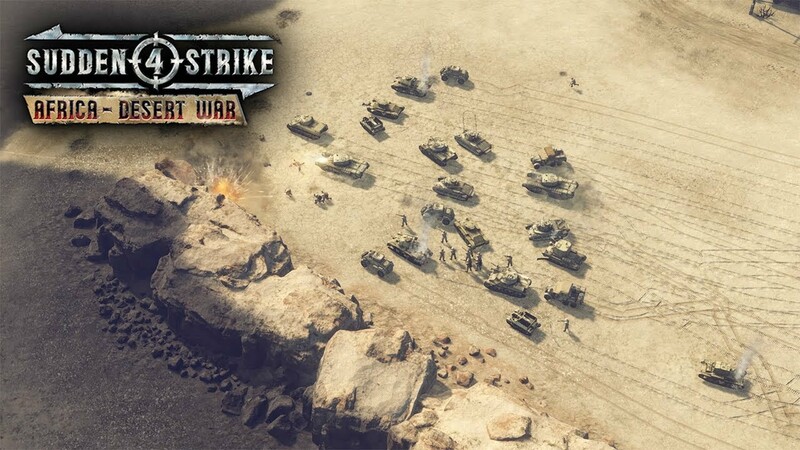 Sudden Strike 4: Africa – Desert War features two new campaigns with six new single player missions from the North African campaign of World War 2. In the Axis campaign, you will start the Italian advance on Egypt to take the city of Sidi Barrani, besiege the city of Tobruk and take over its harbor, as well as break through the Kasserine Pass in Tunisia. In the Allied campaign, take part in Operation Compass and retake the village of Sidi Barrani, relive the watershed of the Western Desert Campaign, the Second Battle of El Alamein, and break through the German defensive line in the Battle of Mareth. Fight in an unforgiving and harsh desert setting with sandstorms to challenge your tactical wits. As well as the new campaigns, players can choose from five new doctrine commanders to lead their troops into battle. On the side of the Axis, armchair generals can choose from the highly decorated German general Erwin Rommel, as well as three additional Italian commanders, including renowned field marshal Giovanni Messe. On the Allies, play as legendary armored division general Sir Richard O’Connor. As the war heads into new territory, Africa – Desert War introduces over 30 new vehicles including an all new medical truck, the Marder II Tank Destroyer, the British Bishop SPG, as well as the Italian Semovente da 105/25 Assault Gun. Africa – Desert War is available now for PC, Mac, Linux, Xbox One and PlayStation®4 (PlayStation®4 out 15th October, Europe only).